One media buyer says first show was 'one long ad for Sky'. 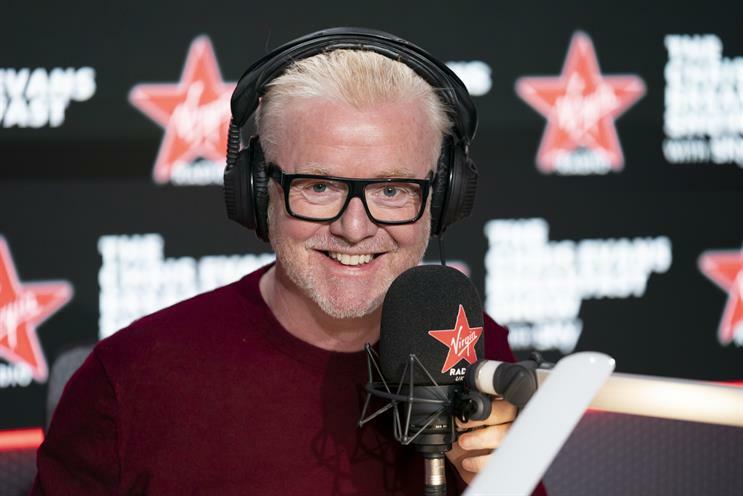 News UK has maintained that the on-air promotional plugs that Chris Evans is giving to sponsor Sky during his new advertising-free Virgin Radio show are similar to what he gave the BBC when he was broadcasting on Radio 2. Evans’ breakfast show debuted today on Virgin Radio with frequent mentions of Sky, the sole sponsor, during the editorial content. There were no ads, but the show did carry on-air promos for Virgin Radio, including a spot featuring Evans’ son, who plays a leading role in a marketing campaign that broke before the weekend. Scott Taunton, chief executive of Wireless Group, the News UK radio division that includes Virgin Radio, said: "The genesis of the deal [with Sky] is this isn’t vastly different from what Chris was doing on his Radio 2 show. "When you listened to his [Radio 2] programme, it didn’t have traditional 30-second commercial spots, but there were many promotions for BBC content." Taunton pointed out how the BBC has more than 50% share of all UK radio listening and although it carries no ads, it does use its own airtime to carry frequent BBC promos "to extend the brand of their products and the content that they produce". He stressed that neither Virgin Radio nor Sky wanted the promotional content for Sky to be "onerous" for listeners. "Many guests [who are planned for his new show] aren’t involved in Sky in any shape or form," Taunton said. Having no ad breaks should help to persuade some of Evans’ nine million Radio 2 listeners to move to Virgin, according to Taunton. "The ad breaks may have been a barrier to them coming to us," he explained. News UK and Sky have not disclosed the value of the 12-month sponsorship deal, but the breakfast show is usually the most valuable and Taunton believes it’s the biggest deal of its kind. "We’re not aware of a commercial radio deal that is worth this [amount] in the marketplace," he said. Virgin Radio has given no audience target for Evans, but it hopes to boost its audience, which stands at 414,000, to become Britain’s biggest digital radio station, which would mean overtaking Bauer Radio’s Kisstory on 2.2 million. News UK’s biggest station, talkSPORT, has just under three million listeners. "Listening to Chris Evans' live show this morning, I'm fully aware it's commercial radio without the ads. The content and guests are good, the chat is relaxed and I like the format, but this isn't commercial radio without the ads. "This is one long ad for Sky, with lots of plugs and mentions throughout, including Rob Beckett and Romesh Ranganathan as guests to promote their Sky One programme along with mentions of Sky Q. "It's the first show, so I would hope that the Sky plugs are fewer as the show settles in. However, I can see the draw for Sky and why an advertiser would partner in this way. I'm sure other advertisers will do the same for the right money and opportunity." "Agencies and advertisers will be closely watching the Virgin Radio/Sky partnership to see how it performs. The standout Sky will get from the deal is unique and will quickly drive brand association and the industry will be keen to see if this delivers results. "Ultimately, the success of the partnership will be driven by Chris’ ability to drive a mass audience. Virgin currently has low listenership and the next few Rajars will be closely watched to see if he can bring along the Radio 2 listeners with him."